My good friend Lee Hoffman and his wife, Betsy, traveled the world for 9 months after their wedding in July 2005 and were living in Mendoza, Argentina, for November/December 2005 and January 2006. Lee and I had coordinated me coming down there after Christmas and us climbing Aconcagua on our own in January. My other good friend, Rob Schnare, quit his job that December and met me to fly down to Mendoza and the three of us would tackle Aconcagua. 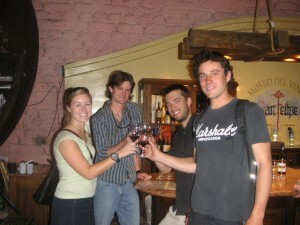 We spent several days organizing mules, permits, gear, etc and enjoying the wondeful town that is Mendoza. 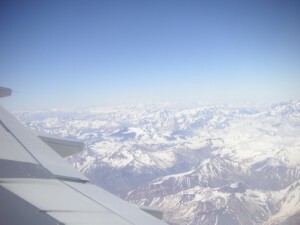 Mendoza is known as the “Napa Valley” of South America with its numerous vinyards and wineries and is located in the foothills on the east side of the Andes. One reason I do enjoy climbing the seven summits is that is takes you to special parts of the world where can experience different cultures and take yourself out of your normal everyday comfort zone back in the USA. We had never organized a full scale expedition before on our own, especially a climb that typically takes 2-3 weeks, but thanks to Lee’s good spainish and our coordinated efforts, we were able to do so with just a few minor headaches. We spent a day hiking and acclimitizing in the hills above the ski town called Penitentes and then set out from the trailhead (7,500′) up the Vacas/Relinchos Valley approach to basecamp with mules and gauchos (Argentine cowboys) quickly passing us with all our gear. 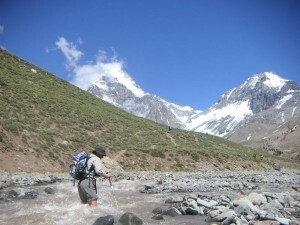 It took three days to hike the 21 miles and 6,500′ to basecamp, aka Plaza Argentina, at almost 14,000′. We spent new years eve at the 8000′ camp and celebrated with the gauchos with a new concoction of red wine and Coca-Cola. 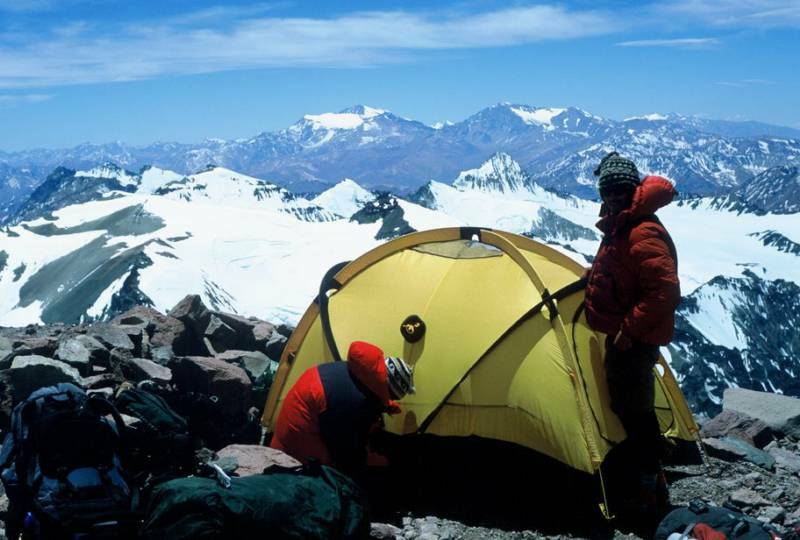 Once at Plaza Argentina, we had a rest day and spent time relaxing around camp and meeting climbers from all over the world. The approach into basecamp and the actual basecamp site itself is quite desolate and lacks vegetation. However desolate the valleys were, the mountains were huge and the views were always neck-bending. Most of the approach was very dry and hot but when we arrived at basecamp, the nights were pretty cold and the days much cooler. The next day we packed up our food and gear that we would use at our higher camps on the mountain and carried it to camp 1 at 16,200′. The route traveled atop scree and talus, which at times was debris on top of a glacier, and through a large field of penitentes (large snow formations that look like ice sickles formed from the ground up and directed toward the sun). Once we cached our gear and locked the duffle bag that held our gear, we returned to basecamp. The next day, we moved camp (tent, stoves, sleeping bags, etc) all up to camp 1 and settled in to the higher elevations. 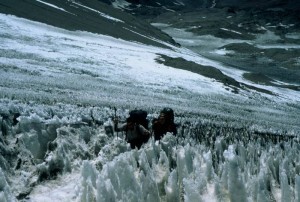 The next day we did another carry of gear and food to camp 2 or our high camp at 19,200′ at the foot of the Polish Glacier. When we arrived at high camp, it was incredibly windy and we soon turned around and made it back down to the safe confines of camp 1. 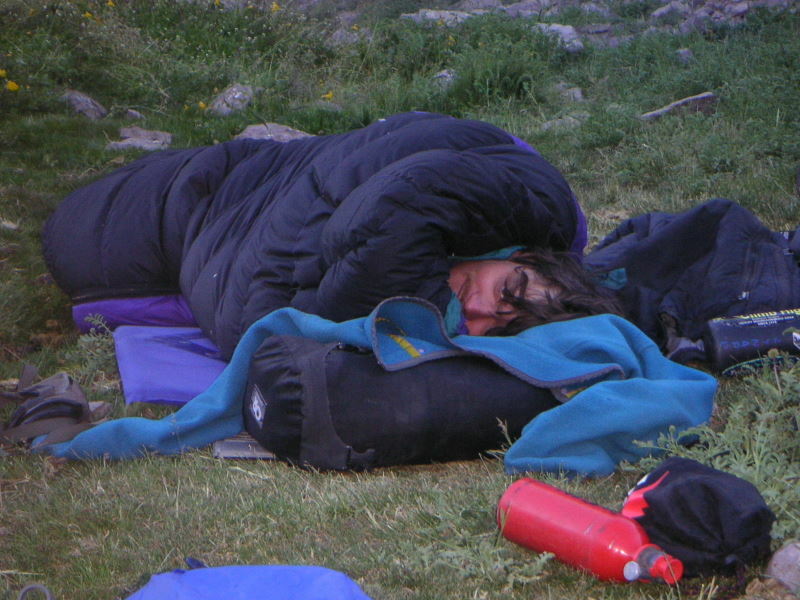 This was a pretty long day and wore us out, especially having gone from basecamp to highcamp in 2 days and having been on the go for 3 days without a rest day. So, we took a rest day at camp 1 reading and relaxing, playing cards, and eating and drinking alot. The move to high camp the following day was tough as well carrying our tent, stoves, sleeping bags, and other miscellaneous gear to an elevation that is the height of the summit of Kilimanjaro. 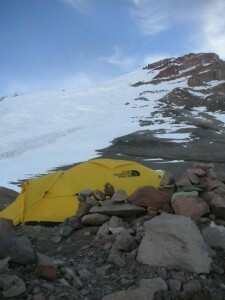 As luck would have it, upon our arrival at camp 2, the wind was very strong and it was a struggle to even set up our tent. 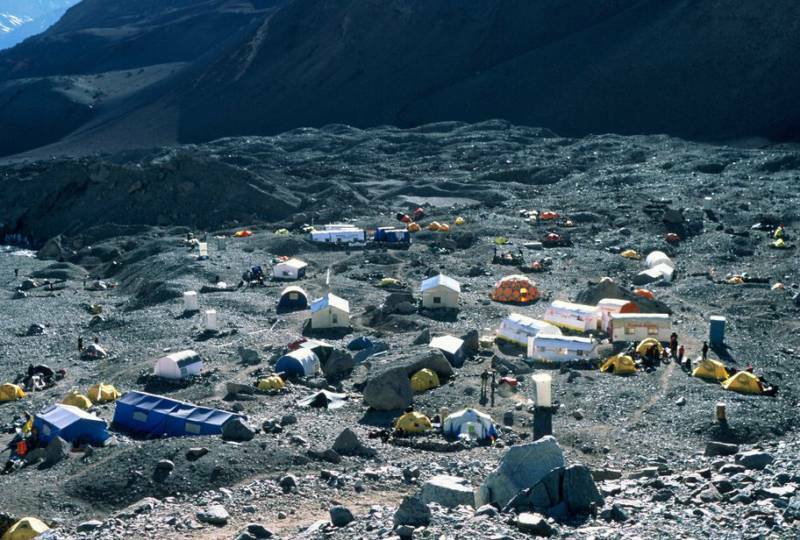 Camp 2 is a pretty inhospitable place and there were probably 6-7 other tents and teams camped all around us. The Polish Glacier rises up over 4,000′ straight to the summit from highcamp and definitely made me want to come back and climb it. Our route, the Polish Traverse, would traverse the lower part of the Polish Glacier, wrap around to the northeast ridge and meet up with the normal route at 21,000′ for the last 1,800′ of the climb. The next three days were definitely the most miserable of the climb. 70mph sustained jet stream winds with gusts up to 100mph continued to punish high camp and ourselves. The funny thing was there wasn’t a cloud in the sky with these winds. However, all in all, it was pretty miserable and one had to crawl out of the tent to go to the bathroom. We read my one book to each other to pass the time and slept. Eating was getting to be more of a chore than a luxury because we were getting sick of all the freeze-dried food and ramen. 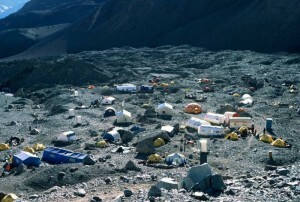 All teams at high camp retreated to 16,200′ camp 1 to wait out the wind except us and one or two other teams. We figured we could wait it out until we ran out of food at our high camp. On the morning of day 4 at high camp, we either had to go for the summit or go down b/c we didn’t have any more food at high camp for another whole day. Finally, when we woke up at 3am on the 4th day at high camp, the winds subsided to a reasonable 30mph and we departed for the summit. After some initial routefinding problems on the lower part of the Polish Glacier in the dark at 20,000′, we eventually found our way and got on route. The sun cresting the horizon was a welcomed event as it immediately warmed us up and we joined up with the normal route at a hut called Independencia, apparently the highest structure in the world (though not much to look at), at 21,000′. It seemed as soon as we joined the normal route at Independencia, the winds that had subsided, showed their teeth again. It was extremelt difficult to hike in 40-50mph winds and the climbing was slow going until we hit the Caneleta, the infamous last 1000′, 30-35 degree pitched talus gully before the summit. Then, again, the winds subsided, and the climb to the summit was windfree. This was the first time I had been above 18,500′ since my Orizaba climb and even though I felt pretty good, I felt exhasuted and weak once I hit 22,000′ probably from not drinking enough water (my camelbak had frozen solid) and hanging around at above 19,000′ for 4 days definily does not make you stronger. I think we all felt the same way. I learned from my camelbak freezing that camelbaks are good for summertime use – not high mountains and winter climbing. Unfortunately, about 30 vertical feet below the summit, we came across a dead climber on the trail. 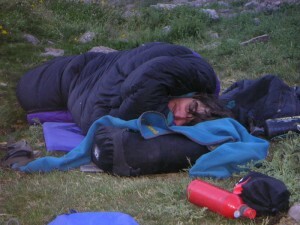 It was pretty sad and it appeared his climbing partners had left him there and pulled his down jacket over his face. This definitely was not something you wanted to see ever or for that matter right before you summit, but it was an eye-opening experince on how mountaineering can be dangerous and brought us a bit down to reality. This was the first time I had seen a dead person outside of a funeral. 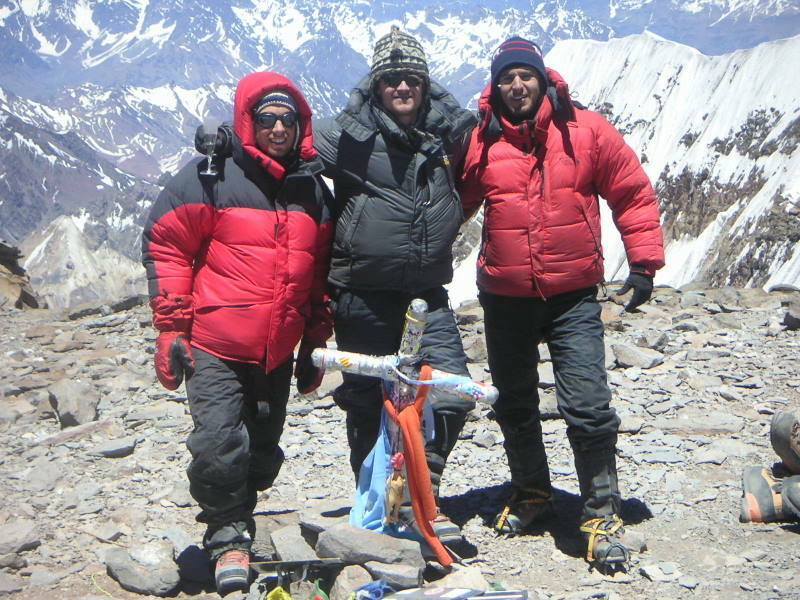 We tried not to let that incident put a damper on the summit and a minute later we were standing next to the summit cross on top of South America at 22,841′. We were all pretty ecstatic to have organized our own expedition and to have made it! All in all, I felt pretty good once I got some food in me but was SO thirsty. An Argentine mountain rescue guy had summitted right after us and was carrying a briefcase-like satchel in his pack. 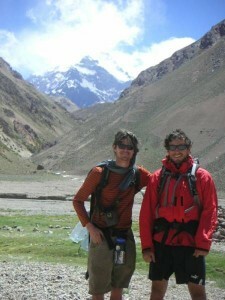 Lee exchanged spainish with him and found out he had come to bring the dead climber’s body down the mountain. He said the dead climber was a 30 year old spainish man who had appreantly suffered from cerebral edema (swelling of the brain with fluid), the most deadly of all high altitude mountain sicknesses, but not very common. The rescue guy then opened the briefcase and in it was a bottle of champagne and 4 champagne glasses. He gave us each a glass and poured us champagne. I couldn’t believe it! However dehydrated I was, I took it and drank it and wow did it taste good and refreshing! Nothing like champagne at almost 23,000′. We took the usual summit photos, I tied this bracelet, made of small 3mm climbing rope I had worn on my wrist for almost 10 yrs for no reason at all, to the summit cross for again, no reason at all, but it just seemed like a good idea to retire the bracelet since it was a very special day. We summitted on Januray 11, 2006, coincidentally the birthday of my golden retriever, Rainier. So, that made the day extra special. It took us about 5 hrs to descend back to high camp making for about a 14 hr summit day. We were exhausted, but we felt so good and so happy with our accomplishment. We spent a 5th night at high camp that night and all slept like babies. The next day, we packed up our very, very heavy packs and hiked down to camp 1 to pick up even more of our gear and food that had been cached. 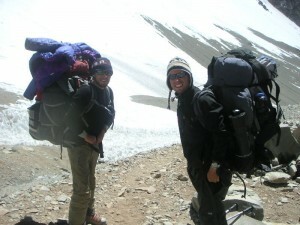 By the time we were hiking between camp 1 and basecamp with probably 90+ pounds on our backs (we literally looked like the Beverly Hillbillies with gear and trash hanging off our packs), I had hit a wall and had just had enough. I had to sit down for awhile and just recover and get a grip. 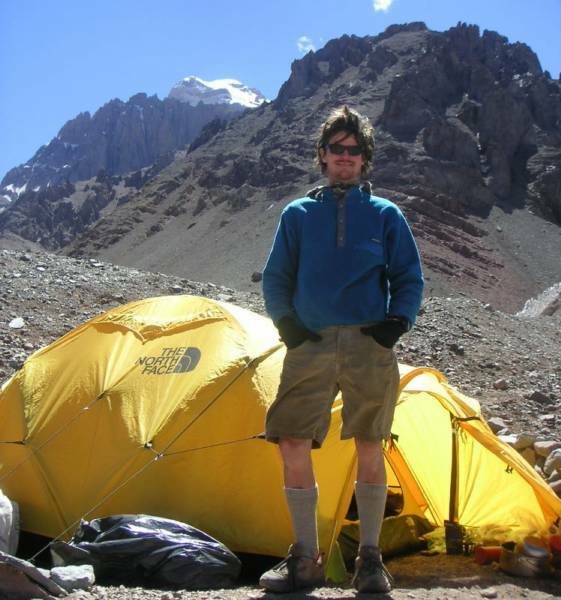 We then made it to basecamp and immediately went and ate pizza and drank beer at a tent run by a few argentines who came up every season and made a killing off serving soft drinks, pizza, beer, etc at 14,000′! I called my family that night froma satellite phone you could rent from the ranger tent at basecamp to let them know our good news. They were all ecstatic! The next morning, we loaded up the mules to carry our gear out the 21 miles to the trailhead and off we went with just our daypacks down to 10,000′ camp. Gosh, it felt so good to give the heavy loads to the mules and to just carry a daypack. We bypassed 10,000′ camp and were aiming to hike to the 8,000′ camp which would only leave us with 6 miles and 500 vertical feet to the trailhead for the last day. Due to the bridge before 8,000′ camp being washed away by the Vacas River only a few days before (and a few mules and people’s gear as well! ), the mules dropped our gear in a pasture littered with mule droppings and so we just pulled out our bags and stove, cooked some dinner, and slept in the grass. However bad the smell was around us, I slept so hard. The next morning we woke up and felt revived and started hiking out. Somehow, and I honestly do not remember how, the mules were able to cross the river and haul our gear out the remaining 6 miles. The hike out was long, hot, and dry and we drank many bottles of water. We finally made it to the trailhead and got a ride back to the hotel at Penitentes. There we ate some monster cheesburgers with fried eggs on top of the patties, but it was the best! 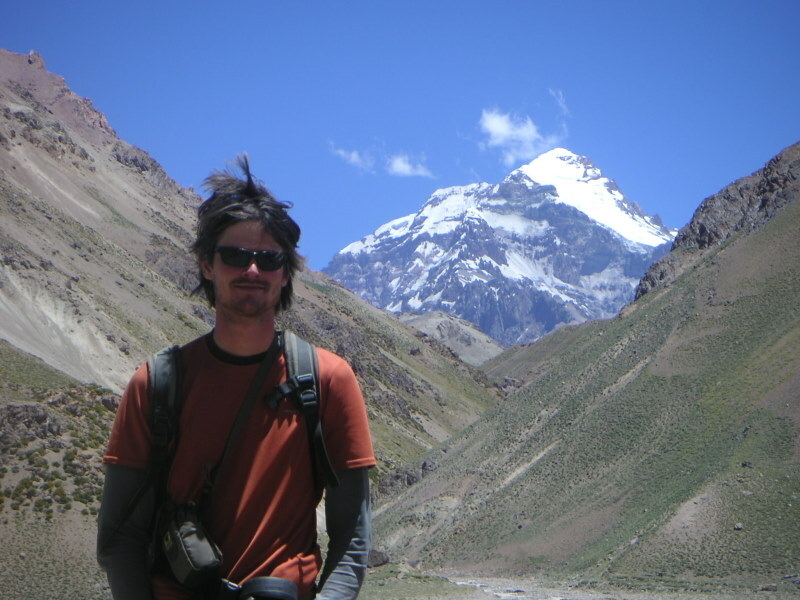 Rob always jokes with us by saying, “I come on these trips for the food and drinks that come after the long climbs.” We then took a 3 hr van back to Mendoza where Lee got to see Betsy again after being gone for over 2 weeks. Rob and I got a hostel while Lee and Betsy went back to their apartment. Rob and I didn’t even recognize each other after we shaved. Our friend and mountain guide, Mike Horst, got a hotel with his clients when they returned from the mountain a day later and Mike was nice enough to let Rob and I stay in his room with 3 beds. Mike was on the mountain with his clients pretty much simultaneously as us and summitted with one of the 3 or 4 clients the day after we did. It was fun seeing him around at certain camps and playing cards with him even though we never climbed with him. It turned out we spent 16 days on the mountain but with 3 of them tentbound at high camp. I stayed in Mendoza for 4 days and we had such a good time touring around, drinking coffee at cafes for several hours, visiting wineries and vinyards, going out to dinners, eating very inexpensive but fantastic argentina beef, and eating lots of ice cream! Ice cream shops are as prominent as gas stations in a US city. They are on all 4 corners of an intersection and the ice cream is cheap and comes in very large scoops! 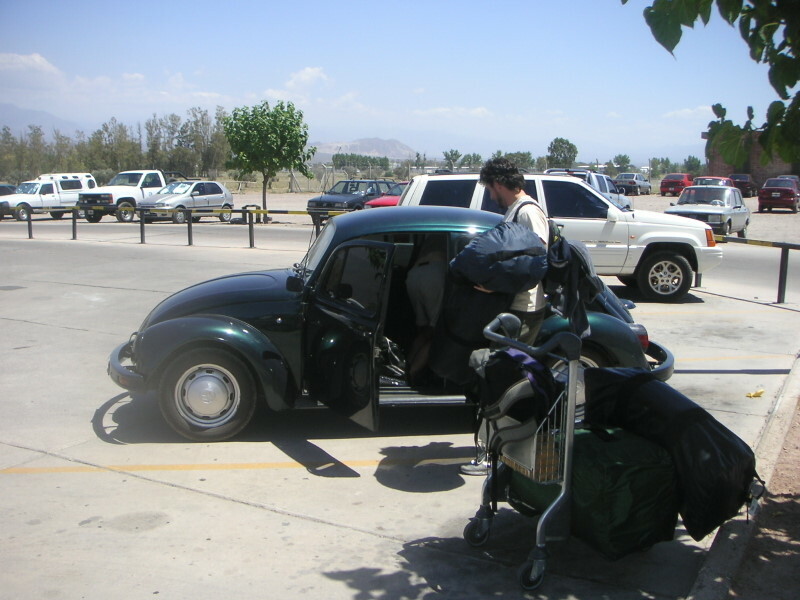 I then flew back to the USA, Lee and Betsy soon after moved out of their apartment and started their road trip south in their “Green machine” bug, and Rob and Mike headed to Chile to surf for a few weeks. This was one of my most special trips and experiences of my life. Not only did I come and climb Aconcagua with my best buds, but I got to experience some of Argentina and its a place I definitely can’t wait to go back. I’m already looking forward to climbing Aconcagua again with Kristine perhaps via the Polish Glacier route itself. Its definitely a challenging route with steep snow, ice, and rock all above 20,000′, but I feel confident we can pull it off in the right conditions and weather. 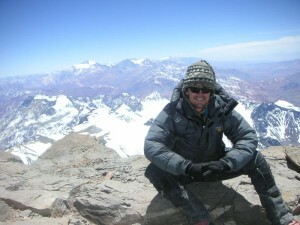 Mike was saying to us in Mendoza we should consider Denali or some other seven summit the next year, but I really didn’t want to think about another big expedition so soon after getting off Aconcagua However, on the plane back to the states, I started dreaming up my next seven summit climb: Denali.